DAY: Thousands or Millions? Why doesn’t Peter say a day is as a million years to make his point stronger? Some people suggest that Fisherman Pete, the Bible writer here, along with most Jews were ignorant of very large numbers. They surely could not have understood an earth that was millions of years old. So thousands was the best poor uneducated Israelite shepherds and fisher folk could do! It actually surprises many moderns to discover that the ancient Israelites really did have words for big numbers. For example: Moses refers to the number of people who fled Egypt as 600,000 men plus women and children. (Exodus 12:37) This means the number who left Egypt was a minimum of approximately two million. Moses also wrote about millions in Genesis 24:60 when Rebekah is blessed by her family with the statement: “Thou art our sister, be thou the mother of thousands of millions, and let thy seed possess the gate of those which hate them.” (KJV) The word translated “millions” in the KJV is myriad. Therefore, even if myriad is limited to only “ten thousand” then “thousands of myriads” would be millions. The statement about a day being as a thousand years was written by the Apostle Peter, who was adapting Psalm 90:4 which states: For a thousand years in thy sight are but as yesterday when it is past, and as a watch in the night. Psalm 90 was written by Moses whose name is very much associated with Genesis and the six days of creation. Peter was familiar with the writings of Moses, which as illustrated above do include the concept of millions. So what did Peter mean by referencing Moses in Psalm 90 and only using numbers such as thousands? A useful logic trick to find what Peter (or anyone) is saying when they use words you don’t quite follow, is to substitute words you do understand for words you don’t understand. So, let’s substitute “Fred” for God, “red” for day, and “green” for thousand. Peter’s sentence now reads: To Fred, red is like green, and green is like red. Now ask: what do we know about Fred? Answer: Fred is colour blind. He is immune to the influence of red or green. Now put God, day and thousand years back in. There is now one obvious meaning: God is immune to the influence of time. But then you should already know that since the Bible is full of statements about how God is eternal. He’s no older today than He was yesterday and therefore does not experience the passing of time as we do. So why didn’t Peter write “a day is like a million years” to make his point stronger? Surely the end result would have been the same. But the basic art of communication is to start with what your readers are familiar with. Peter was the Apostle to the Jews. They would have been familiar with Psalm 90 and all the writings of Moses, including Genesis. They knew that nothing in Moses writings gave any hint the earth was millions of years old. Since Peter’s readers had been ruled by both Greeks and Romans they were also familiar with pagan theories about an earth of vast age, hundreds of thousands and millions of years, but they had no reason from Genesis or Biblical genealogies to allow any thought about the earth having been made over millions of years. So Peter, the Apostle to the Jews, wrote for an audience of people, to whom it had not occurred that any of the writings of Moses account of creation hinted at anything other than the use of solar days or an age of thousands of years. And since it is also the Apostle Peter who tells us in 2 Peter 1:19-21 “Knowing this first, that no prophecy of the scripture is of any private interpretation. For the prophecy came not in old time by the will of man: but holy men of God spake as they were moved by the Holy Ghost.” (KJV) Peter is also telling us that the holy man Moses never wrote about millions of years, and never intended his readers to even think that he did. Neither did Moses’ mentor, the Holy Spirit, so neither should we ever try to merge pagan beliefs about vast ages with the straight text which tells us an all powerful all knowing God did it in just six ordinary days. 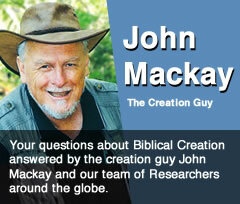 Did Jesus believe 6 day creation because he was fully man and therefore ignorant of modern science? Answer here. Why do you claim Genesis days are 24 hours when Augustine said they are indefinitely long periods? Answer here. Available at the Creation Research webshop.